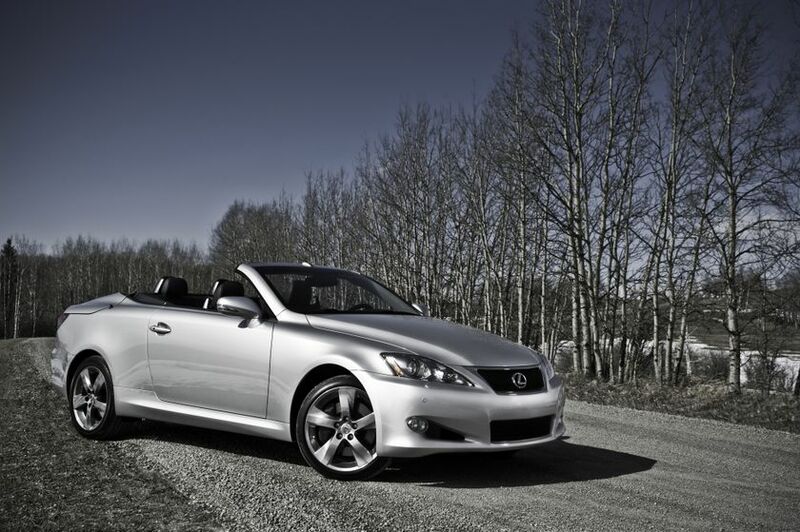 (TORONTO, ON – September 9, 2014) The Lexus IS C delivers all the top-down motoring pleasure of an elegant convertible plus the performance and style of a sleek sports coupe. Available with a choice of two V6 engines, the IS C is designed and engineered for outstanding looks and driving enjoyment. The IS C series is built around a choice of two powerful V6 engines, each fitted with Dual VVT-i and other technologies to maximize power across a broad speed range while boosting efficiency and minimizing emissions. Every 2015 IS C features a six-speed automatic Super Electronically Controlled Transmission, sequential shift mode and paddle shifters, delivering power to the road via the rear wheels. Confident driving is assured with many driver-focused handling and control systems – including Vehicle Dynamics Integrated Management and highly responsive electric power steering. Front and rear suspension systems and a highly rigid body structure are designed to enhance road feel and agility for responsive handling and stability at highway speeds. The IS C series rides on 18” alloy wheels with P225/40R18 tires up front and P255/40R18 tires at the rear. Every 2015 Lexus IS C is standard equipped with an extensive array of active and passive safety systems, including: Vehicle Stability Control; Traction Control; Antilock Braking System with electronic brakeforce distribution and Brake Assist enhancements; Lexus Smart Stop technology; eight airbags; ventilated front and rear disc brakes; three-point lap and shoulder belts with pretensioners and force limiters; anchor points for child seats; a direct tire pressure monitoring system; high visibility LED brake lamps and daytime running lights; and more. Every IS C is also luxuriously appointed with many comfort and convenience features, including: A premium audio system with USB audio input, Bluetooth capability and integrated Sirius XM Satellite Radio; dual zone automatic climate control with intuitive feature to adjust for open or closed top motoring; eight-way power adjustable, heated and ventilated driver and front passenger seats; premium leather seating; a DVD-based navigation system with back-up camera; multi-information display; dual illuminated vanity mirrors; power windows with driver and front passenger auto up/down function; leather wrapped three-spoke steering wheel fitted with paddle shifters and mounted on power tilting/telescoping column; metallic shift knob; wood grain interior trim; aluminum sport pedals with rubber inserts; cruise control; the Lexus Smart Key System with Push Button Start; integrated garage door opener; high intensity discharge headlamps with the auto leveling headlamp system and headlamp washers; fog lamps; and more. The IS 250 C is built around a 2.5L V6 delivering up to 204 horsepower, with a combined city/highway fuel efficiency rating of 9.6 L per 100 KM*. Additional standard features include: auto-dimming rear view mirror; rain sensing wipers; driver’s seat memory system linked to mirrors; and rear passenger seat one-touch walk-in function. The IS 250 C may also be ordered with an available F SPORT Package. This package features: a single in-dash DVD; clearance and back-up sensors; a hard drive-based navigation system with back-up camera; sport-tuned suspension; and a colour-matched full skirt package. This package also includes several F SPORT details, such as: steering wheel, unique 18” alloy wheels, leather seats, front grille, and scuff plates. The IS 350 C F SPORT is built around a 3.5L V6 delivering up to 306 horsepower, with a combined city/highway fuel efficiency rating of 10.6 L per 100 KM*. Additional standard features include: a single in-dash DVD; clearance and back-up sensors; a hard drive-based navigation system with back-up camera; sport-tuned suspension; and a colour-matched full skirt package. This model is also standard-equipped with several F SPORT details, including: steering wheel, unique 18” alloy wheels, leather seats, front grille, and scuff plates.